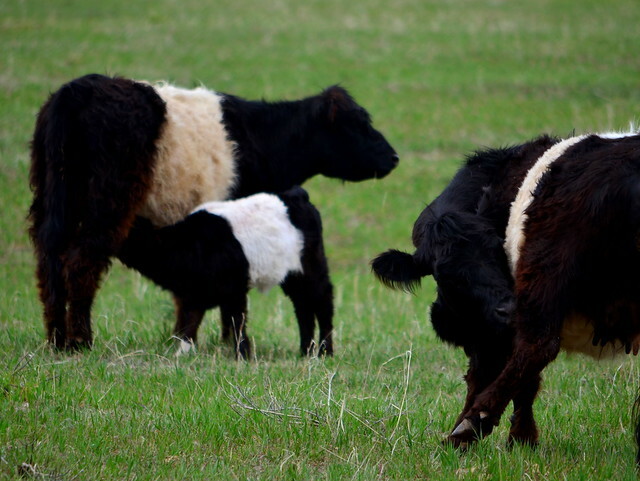 The Belted Galloway is a somewhat rare breed of cattle originating from southwest Scotland. We call them Oreo Cows, for obvious reasons. Apparently, the global population is only 10,000 individuals. They are highly prized as quality beef for eating (placing at the top when compared to eleven other breeds), and are very hardy. They thrive on coarse grasses and rough pasture land that other cattle would shun. I took my daughter to a pasture a few miles from our home to watch them graze for a while. I was focused on the baby and it’s mother when I moved over and caught this other cow in the frame. In reality, it was just nibbling at its leg, but I think the photo makes it look like the cow is jealous and wants to get some milk, too.